One of the suggestions I received in my reader survey was a post about how to recycle properly; your wish is my command! For me, recycling is like riding a bike. I have some vague memories of my Mum teaching me how to recycle when I was a kid, and it’s something I’ve done since then. Ok, so that’s not like riding a bike because I haven’t actually ridden a bike in….a very, very long time. I’ve never known anything different and tend to think everyone else knows how to recycle, too. 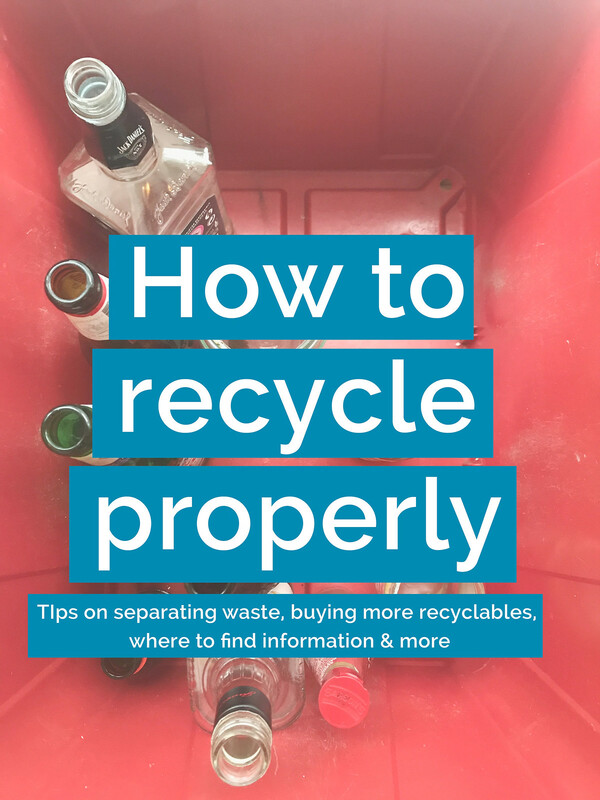 I recently learned that one of my oldest friends had to be given a recycling masterclass by another friend – I can’t believe I hadn’t lectured her already! I’m actually a little saddened by that missed opportunity. If there’s ever anything I talk about and don’t explain, please ask me in the comments, email me, or get in touch on social media. I am a sustainable living fangirl and would be more than happy to bombard you with information. Recycling can feel daunting when you start out because trying to remember what can and can’t go in specific boxes and bins can easily get confusing. I promise, it will become second nature in no time at all and you will soon be telling off your family and friends for putting something recyclable in the general waste bin. Yep, I’m sorry, you’re gonna become known as “that person”, or “Rosie vs. the world”. It’s kinda fun, but it doesn’t come with a cape – it should, though. Why don’t we all just put everything in one bin? We recycle to help things be reused, to reduce the amount of non-renewable resources (like oil, natural gas, metals, etc) we’re taking from the planet, to reduce our impact on the environment, to get the most out of materials, and to make our lifestyles more sustainable. All of that helps us to work towards a more circular economy – I am planning to write a blog post about what this is, but for now, WRAP has a really short and sweet guide on circular economies and the benefits. It all boils down to us putting as little as possible in our general waste bin. It’s actually quite a fun challenge to have with yourself – that sounds really sad, but you will feel joy for seeing a slightly emptier general waste bin. It’s the small things in life. The best thing you can do is look at your local council website. In the UK, our local councils provide us with all the information we need about what each bin/box is for, what can and can’t go in it, and when it’s collected. I can’t speak for every single country on the planet, but I imagine your local council or government should provide you with that information online, or perhaps in a leaflet you could request. Because of the differences in the UK alone (let alone in other countries) there is no point me writing a blog post saying “you can put this type of waste in this bin” because we have different coloured recycling bins in different councils in the UK (DON’T ASK, IT MAKES NO SENSE), and some councils won’t take things in some bins that others will take. Again, IT MAKES NO SENSE! The easiest thing for you to do is head over to your council website. print pages out telling you what goes in what bin, and stick them near your bins so you can see it easily. It’s also really handy if you’ve been recycling for years (especially if you move into new council areas or a new country) to have a little refresher every now and then. For years, I thought you could put wet cat food pouches in the recycling bin because it’s made from metal – turns out you can’t. Oops. It’s easy to develop those kinds of associations about a type of material, so refresh your memory if it’s been a while since you looked at the lists. And if you’re not sure about an item, pull the website up quickly and check. I would like to apologise for all the tins and jars I threw in the recycling bin without washing out. I’m very sorry; I was lazy, there really is no other excuse for it. Leftover food in your recycling can contaminate other items and make it unrecyclable. For example, if you throw out an empty tin of soup and a bit of leftover soup leaks onto paper or cardboard, that paper or cardboard may no longer be recyclable. Get into the habit of washing tins and jars out as soon as you’re finished with them, instead of throwing them straight into the bin. Not only does this mean you are preventing contamination, but it stops your bin being really gross. And let’s be honest, the less time we have to spend cleaning out bins the better. If, like us, you have a glass bottle and glass jar bin, make sure you remove the lids and put them in the right recycling bin. The same goes for things like ready meals or meats; remove the film because the film probably isn’t recyclable. I really wish this wasn’t even something I have to talk about, but I do. If you’ve been reading my blog for a while, you know how angry I’m about to get about “not currently recycled” packaging. It is easy to assume that all plastic is recyclable. I did it up until a couple of years ago; anything plastic I put straight in our recycling box, because it’s plastic and you can recycle plastic, right? Turns out, no. Not all plastic is recyclable and unfortunately, a large amount of plastic packaging in the UK (I can’t speak for elsewhere) bears the awful label “not currently recycled”. Not only do I encourage you to look at packaging as you’re stood in your kitchen about to throw something away; I encourage you to begin reading packaging in supermarkets and trying to buy less “not currently recycled” packaging if you can. I fully understand that’s not always possible, and let’s move off this topic before I start ranting about Tesco and their organic oats again. I also fully encourage you to angrily tweet companies asking what their wishy washy “not currently recycled” rubbish is about, and tag the Not Currently Recycled Twitter account, also. What do I do with things I can’t recycle at home? You can’t recycle everything at the kerbside, and this is where you’ll have to do some research. For example, I can’t put clothes or textiles in my recycling bin. Instead, I can donate things that are still usable to local charities, or in clothing/textile bins at supermarkets or refuse centres. Batteries are not recyclable kerbside, but again you can recycle them at refuse centres. In the UK, the Recycle Now and Recycle For Scotland websites are incredibly helpful. Again, your council website will probably also tell you where to recycle things you can’t put in your normal bins. Before we go and you start wielding your new recycling powers I want to say one more thing. There is a lot of pressure put on you and me (as consumers) to “do more”. We can only buy what manufacturers and shops make available to us, and sometimes that means buying something in non-recyclable packaging. Don’t feel bad about that; instead, ask companies why they’re making these choices and ask them to do better. And if they won’t do better, vote with your money. For example, I’m not buying Quorn sausages until they make their packaging recyclable – instead, Linda McCartney has my money. (We’ll ignore the fact I can’t even eat Quorn snosages now because I’m vegan and they aren’t – but you catch my drift.) In fact, I’m not buying a thing Quorn sell until they fix their packaging because I have other choices in better packaging. So far in 2018, I have seen a lot more people calling for better packaging options and that warms my soul like a nice toasty campfire. This is what we need more of. We need to hold companies accountable, ask for change, and vote with our money. If you have any more questions about how to recycle, or want me to cover another topic, please let me know and I’ll get right on it.